Some of you may remember that I had a work study job for a little while last spring. It didn’t work out, sadly, because what the planetarium really needed was an evenings-and-weekends show presenter, and I couldn’t work at those times, so I ended up just being the IT monkey, and well, no thanks. There wasn’t even really enough for me to do to justify that, so, with regret, I left. 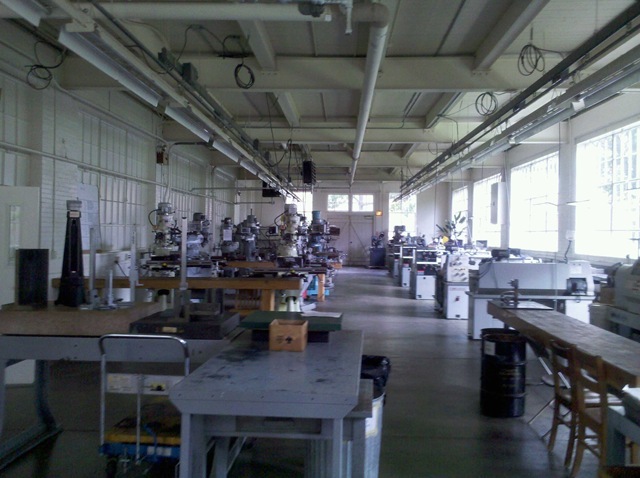 Toward the end of the semester I noticed a sign on the door to my CAD classroom noting that the MechEng Tech department needed work study students to work in the tool crib of the Machine Tool Lab. Students in said capacity would be working for Joel Anderson, the machine tool instructor, and the requirement listed (apart from having a work study award in one’s financial aid package) was “must have passed MET 107”. I was in MET 107 and doing well, so I thought, Hmm, and went on with my day. At semester’s end, fairly sure I’d passed, I was helping Joel clean up the shop for a little extra credit and to be a Good Academic Citizen (hey, don’t laugh, it was a good class), and I mentioned to him that I might be interested in the job this fall. He told me to send him an email come mid-August, when the start of fall semester approached, and remind him. – Manning the Tool Window. Students needing tools will present themselves at this window and tell me what they need. I will find it for them (if I can) and write down what they have against their name on a ledger sheet on my bench. When they’re finished with it, or in any event by the end of the lab period, they’ll bring it back and I’ll cross it off their list and put it away. Or possibly tell them to take it away and clean it before they presume to return it, but so far I haven’t needed to do that. – Locking up the crib and indeed the lab itself after class. – Taking point for evening lab sessions. “Night lab” is an optional extra time when the lab is open for students to come in and work on their projects. This becomes especially popular toward the end of the semester, when it begins to dawn on them that time is getting short and they don’t have all their parts made yet. I spent a bit of time in night lab myself last semester; it was nice. Low-pressure. This semester, Joel doesn’t have a TA willing to do night lab, so on Mondays and Wednesdays it’s just me, in here from 6 to 9, providing tools and rather dauntingly In Charge for purposes of the university’s safety rules. I’ve got a key that opens the building, the lab, and the crib; I’ve been shown how to turn the lights on and off. That’s about all the qualifications you need. 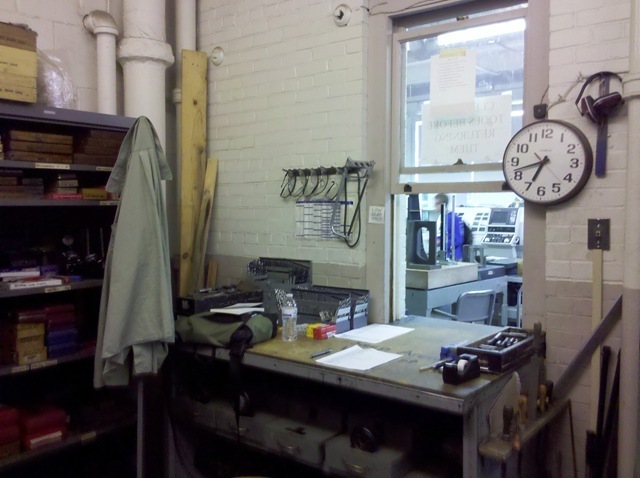 At right is a photo of the tool window from the other side, showing my workbench – as close as I get to having an office. You will note the assortment of drill bits, the cabinet to my left containing various useful items, and the clock, which does not work, such that it is always 6:42 in the tool crib. 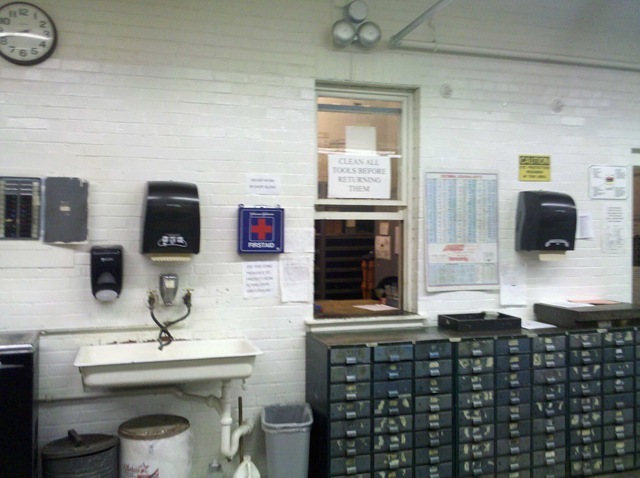 At left is a photo of the machine tool laboratory (MTL Room 101, not to be confused with the Machine Tool Laboratory, which is the building). Pretty straightforward: Bridgeports on the left, lathes on the right, band saws down back, surface plate and height gages in the foreground. Not pictured is the CNC mill, which is to the photographer’s right past that bench, and which mere mortal students are not permitted to touch until they get to MET 313. 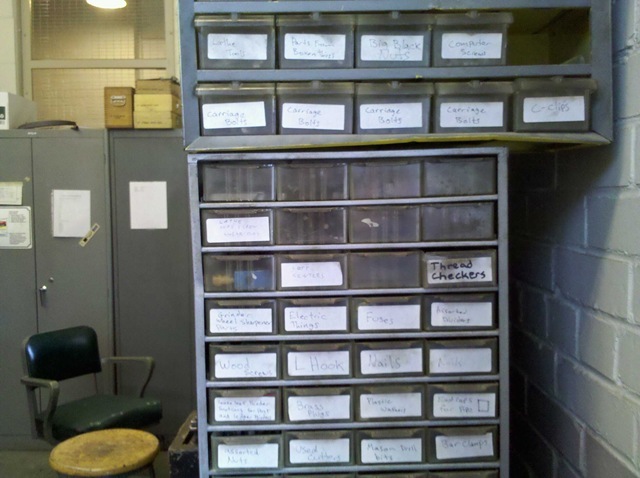 The tool crib is to the photographer’s left. This is a pretty swingin’ place to work. It’s definitely more old-school and industrial than the planetarium, which, apart from the actual planetarium part that I was not allowed to touch, was basically just an office like any other. This makes me feel more like when I was a kid and my father worked in a similar sort of setting, and I would go into work with him on the weekends. It smells the same, and scents are very nostalgia-inducing. I like it a lot. Part of that is just because I have the key to the toy cupboard. I mean, we’ve got everything in here. Here in the cabinet immediately to my left are parallels (for putting things in mill vises so they don’t bottom out in the vise), indicator sets (for ensuring that the mill tables are level), all kinds of gages and micrometers, devices for ensuring that you have your lathe tool set properly for cutting threads, machining squares, combination squares, dial and vernier calipers, gage blocks (for calibrating other gages)… it’s like Christmas for machinists in there. Behind me are the shelves containing more of the slightly-less-often-used items. 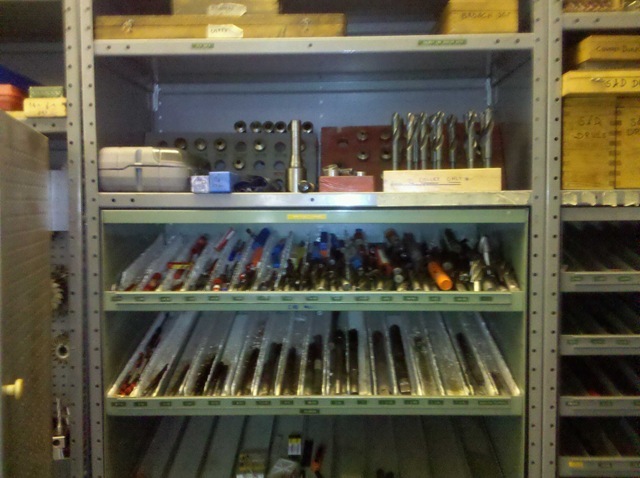 We keep the most commonly used drill bits and end mills (the latter drill-bit-like tools used in vertical mills for… well, for milling the ends of things, hence the name) on the bench by the window, but at left we see the shelves behind me that contain the rest of the smorgasbord of drills and mills, plus the center drills (not sure why we don’t keep those on the bench, actually, they’re pretty frequently needed – must ask Joel). Not pictured is the lower shelf that has the really freaking big drills. I’m not even sure what we use those for. They’re way too big to be used in the Bridgeports we have here. At right, one of my favorite of the many toy boxes in here: The Cabinet of Cutters! Here we have saws, saws, some more saws, and the ever-popular face mills (another tool for the Bridgeports, used to surface the top of a bit of stock – and if you’re not careful, the vise jaws – as opposed to the end). The face mills are kept in those silver cardboard tubes because their carbide teeth are very fragile, and if you chip off a corner it’s pretty much useless until someone indexes the tooth. At best you’ll get a lousy finish; at worst it won’t work at all, and may actually damage the base of the tool. I should probably wrap this one up. It’s getting on toward 4:30 and the guys (and it is all guys, alas – a girl or two in the mech eng tech program would class the place up a little) will be bringing their tools back soon. 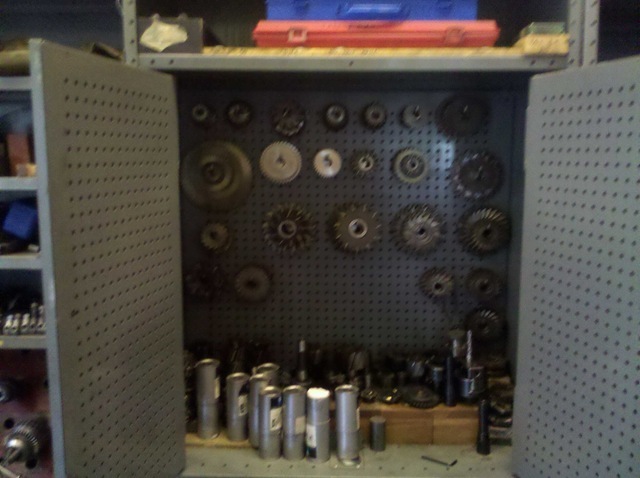 Besides, I’m sure the pictures of the tool crib are a lot less interesting than I want to think they are. My point is, as work study gigs go, this one is pretty sweet. It has its dull parts, like now, when everyone’s out there working and nobody needs anything, but that just means it’s possible to get the “study” part happening (or blog, like I’m doing now). All I need is a better chair (and Disability Services is working on that, because they handle all the special furniture requests on campus), and I’ll be set. It’s a weird feeling. I haven’t actually liked a job in… jeez, a long time. Oh, one more photo. 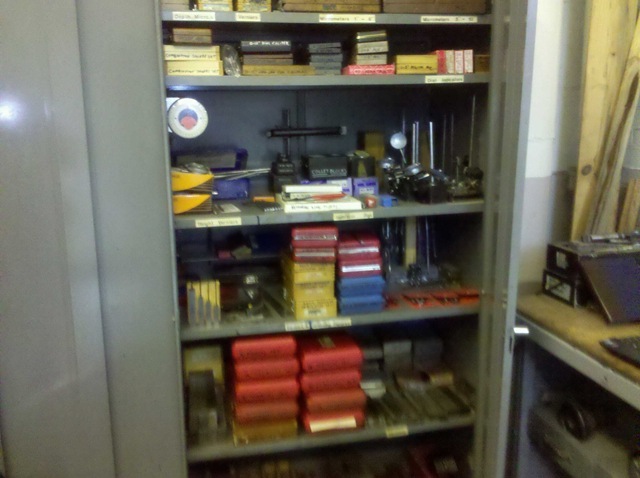 This is an organizer next to the door in the tool crib. It was labeled by some previous workstudy student who was not entirely sure what some of the things he was tasked with organizing actually were. As a result, some of the drawer labels are a bit entertaining. My personal favorite is the one marked ELECTRIC THINGS. Later, perhaps I’ll talk a bit about some actual classwork that’s going on this semester. I know, crazy idea, huh? Blog about college in a college blog? What will they think of next? Professor Teller’s Infernal Machine A Strange Game, etc.